Dec 15: 2:00 pm - 3:30 pm "Keeping and Artist's Journal -- An Introduction to Drawing" art class at Berryhill Baja Grill 1201 W 43rd St, Houston, TX 77018, cost: $40. Registration and more information. Nov 10: 2:30 pm - 4:00 pm "Sketching and Drawing Animals--- An Introduction" art class at Berryhill Baja Grill 1201 W 43rd St, Houston, TX 77018, cost: $40. Registration and more information. Oct 17: 2:30 pm - 4:00 pm "Keeping and Artist's Journal -- An Introduction to Drawing" art class at Berryhill Baja Grill 1201 W 43rd St, Houston, TX 77018, cost: $40. Registration and more information. This entry was posted in Events and tagged events on May 23, 2013 by steven. 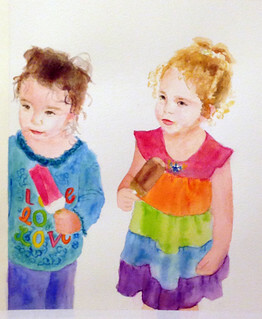 This is a painting of my nieces, Liori and Ariela, at about 3 years old. I love painting people portraits. This entry was posted in Watercolors on May 3, 2013 by steven.